ALL OUR WAITING AND HOPING, AND YOUR PRAYERS AND SUPPORT, FINALLY PAY OFF! Well just in case you haven't heard, we have finally adopted our second baby! Her name is Macie and she is now almost two months old. 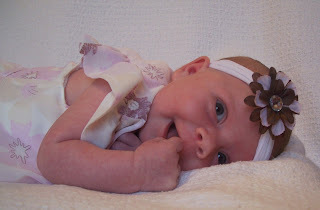 Her birth mother chose us through profiles at the agency we were on file with, and announced to us when she was about to find out the gender of the baby (right around 20 weeks). We went with her to the ultrasound and found out that we were going to get a little girl. Macie was born on March 12th and weighed a tiny 5 lbs. 9 oz., and was 18 inches long. She was little, but full term and very healthy. We brought her home when she was two days old and have had a great time getting to know her. Caleb loves her and is a great big brother. She loves him too. . . just this week started reaching out for things and his head was the first thing she went for. Thank you so much for all your prayers, your thoughts, and your support. Adoption is a miraculous, but often a very difficult, journey and we feel blessed to have family and friends who can help us through it. Much love to you all. Matt and I met in college, during what was my first semester at the University of Utah and what was his first one back after serving a mission for our church for two years in Stockholm, Sweden. 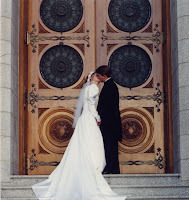 We had a quick courtship and a short engagement and we were married on September 3, 1996, about 10 months after our first date. I guess we just knew that we were right for each other. We spent the next several years pursuing our educations before deciding that we were ready to start our family. It turned out that we were unable to get pregnant when we starting trying. We saw fertility doctors and spent the next several years undergoing treatments and procedures, all expensive and all unsuccessful. At that time we were frustrated and upset that nothing worked for us. As Matt finished his graduate schooling, we decided that as soon as we returned to Utah to live, we would look into adoption. We completed our paperwork with the agency we chose, LDS Family Services, and were approved for adoption on March 22, 2005. Through the agency's services, we were chosen by Caleb's birth mom to be his parents, and found out about him on November 1, 2005. He was born a few days overdue on December 19th and after his release from the hospital, we brought him home on December 28, 2005. We are so grateful for Caleb, and for his birth mom who chose us. We knew the moment we found out about him that he was meant to be in our family. We thank God every day that his birth mom knew it too, and followed her heart, made an unimaginable sacrifice, and sent him to us. 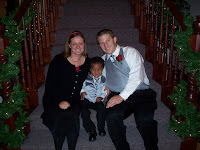 We are now hoping for another child to join our family, and we know that for us, adoption is the right way to do that. We love being an adoptive, multiracial family. It gives us a unique identity and it is what makes us…well, us. Click "comments" below to see what our friends and family have to say about our little family. I grew up the oldest of five children, and like Emilie, have a close relationship with my parents, brothers, and sisters. I enjoy getting together with them often for big family dinners and games. I love to play and watch basketball, especially the Utah Jazz. If I could have grown another ten inches I think a professional basketball player would have been a great job. Because the basketball career didn’t exactly pan out, I decided to stay in school and graduate from the University of Utah with a bachelor’s degree in Exercise and Sport Science. I went on from there to get my Doctorate in Physical Therapy from the University of the Pacific. I love being a Physical therapist and helping my patients return to the functional activities they have lost due to surgery or to illness. Besides work and basketball, I enjoy being outdoors, especially boating and camping, and eating at good restaurants. What makes those things even more fun is being able to do them with my family. I feel very blessed to have Emilie and Caleb in my life. We have lots of love and lots of fun in our home. I grew up as the oldest of three kids in a very traditional and close-knit family. I have one brother and one sister. Looking back on my childhood, I can’t believe how lucky I was to be raised in a loving and secure environment. I met Matt during my first semester at college. I graduated from the University of Utah with a Bachelor’s Degree in Business Management and spent several years in the work force before becoming a mom to Caleb and choosing to stay home with him full time. I had always dreamt of being a full-time mom and despite the temper-tantrums, the messes, the piles of laundry and dishes, I’d have to say I’ve never been happier. I love to read and play the piano when I have a little bit of spare time. I love music in all its forms and would love to learn to play the guitar. I am in charge of the children’s program at my church and love to watch them as they learn about God, Jesus, and about their own purpose in this life. I have hair that I can’t control, and I hate to cook. I also hate spiders and bugs. I love to be outside and I like to walk to the grocery store or the park with Caleb whenever I can. I’m learning a lot about gardening, and in the summer I spend most of my time weeding the granny garden we inherited when we bought our house. It's hard to find the right words to describe Caleb...maybe "live-wire" would work. He is truly one in a million. To start with, he is all boy through and through. He loves trucks, four-wheelers, motorcycles, trains, etc. His favorite movie is Disney's "Cars". He has a really great memory for a three-year-old and loves to quote movies, songs, and things that he has heard people say. He is talking really well, and has lost most of his baby words, although occasionally he will say something like "mackey-oni cheese" that will make us smile. Caleb loves music, has a good sense of rhythm, and likes to sing. He has very strong opinions about his music, and we argue about what CD to listen to in the car like he's 15 or something. He is currently into ad-libbing, and loves to make up his own lyrics (usually about trucks) to the songs that he's listening to. He is a quirky little guy, and can be very stubborn, but he's the light of our lives and we thank the Lord every day that we were chosen to be his parents. He is so like us in so many ways, there is no doubt that he was destined for our family.